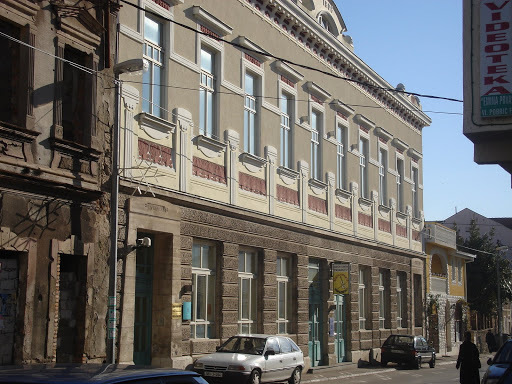 This week I have been reading about arts initiatives in post-war Bosnia-Herzegovina, and about the work of the Pavarotti Music Centre [PMC] more specifically. I have a personal connection with the PMC, as I worked there as a volunteer music leader for most of 1998. Reading about Bosnia-Herzegovina in that post-war era is bringing back lots of memories for me and I find I am frequently going off into very vivid recollections of different events from the time that I was there. These recollections have also infiltrated my dreams. It is a surprisingly intense process at the moment. It’s interesting that much that is written about the PMC focuses on the music therapy program. This was the strand of work that had funding for the longest time, and perhaps that is the reason it is (more) well-documented; however, my primary interest is in the strands of work that I was part of – the outreach work in local schools and refugee camps, and the workshops and classes that took place in the centre and were open to all local people. (Another reason for this difference in documentation and analysis may be because music therapy is well-established as a research field, whereas the practitioners in the outreach and community programs came from a far more varied range of disciplines and academic experiences. Furthermore, scholarly writing about community music is a comparatively nascent field. These programs were in operation in the late 1990s, a time when practitioner-led writing about community music work was only just cranking into gear, and was still very localised to the UK. Let’s face it, the vast majority of community music practitioners were at that time, and still are, freelance artists, dependent on generating paid work to make a living. The time to sit down and write reflectively for scholarly publications was a luxury that most did not have). Haskell’s writing on post-war Sarajevo is hugely illuminating, and I am devouring it as fast as I can. The corruption and misappropriation of funds at the Pavarotti Music Centre is definitely an important part of the story (as are the power issues at play that enabled it to happen, and are such a dominant part of cultural regeneration in post-conflict settings), but I believe there was also a huge amount of good work that the PMC did, that made a difference to the lives of those young people taking part. There is much to examine and this is why the Pavarotti Music Centre is a definite case study for me. Haskell, E. N. (2011). Aiding Harmony? Culture as a tool in post-conflict Sarajevo. Unpublished PhD thesis. Brown University. I enrolled in PhD studies (at Griffith University) at the end of February, and have since been throwing myself into it on a fulltime basis (taking a bit of time out here and there to lead short-term composition/improvisation projects, which are the main content focus on this blog). Let me introduce you to my big, crunchy PhD topic – I’m examining the impact and contributions (if any) of music education initiatives in post-conflict settings. I want to look at some big initiatives from the past that had lots of international support and media attention, such as the Pavarotti Music Centre in Bosnia-Herzegovina, as well as projects that are in operation right now. I find I love the luxury of time that I have to settle into my topic, to read, and then write responses to what I read, and to reflect and ponder and observe the way these reflections become new branches or nodes on the tree-like structure of my topic. Where does the reading start for a topic like this? 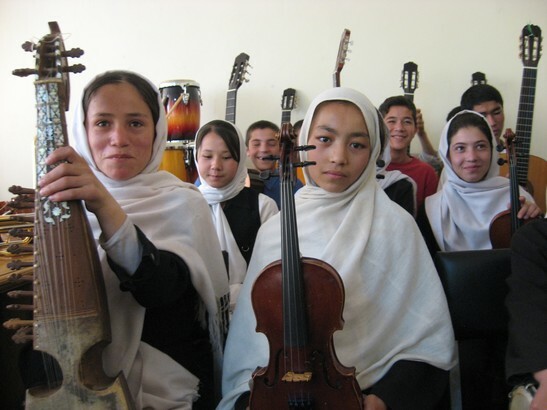 Surprisingly (given the amount of media attention these initiatives can garner) there is little written specifically on post-conflict music education initiatives themselves. There is a bit more if you go into the area of ‘music and social change’ (El Sistema and other similar projects around the globe – see the links I’ve added to my Blogroll for some of these) and there is some literature on the Israel/Palestine conflict (although this work cannot be considered ‘post’-conflict – I am limiting my scope to post-conflict settings at this stage). Music therapy has also turned its attention to conflict settings in the last 20 years, so there are some interesting perspectives and accounts to be found there as well. This is also a multi-disciplinary topic. I find I am looking at writing from a wide range of disciplines, including (music) sociology, anthropology, conflict studies, international development, music therapy, education, peace-building… to name just a few. In these first few weeks, my approach is to consider some of the reasons behind the existence of the kinds of music initiatives I am interested in (which are music schools and community arts centres that offer opportunities for participation in music activities), and focus my literature searches and reading in response to these. the necessity of creativity and creative outlets to survival in unpredictable, unstable environments. Therefore I’ve been reading everything I find about arts in post-conflict settings, as well as under the ‘music and conflict transformation’ banner, and more generally about ‘education and reconciliation’. It’s a pretty stimulating, fascinating, complex topic to be exploring, so in these early, heady days of full-time research, I am wildly, unreservedly, passionately excited about my project. Yes! (It’s important to declare this right now, because the standard PhD narrative has the researcher hitting a bit of a slump in the second year. I want to be able to return to this post to remind myself of this early energy :-)). Yesterday we presented the second stage of Nests, a theatrical music installation that I am developing over three stages at ArtPlay with collaborators Rebecca Russell and Ken Evans. As an installation experience rather than a workshop, Nests is largely un-facilitated, and the children are free to explore the environment in whatever order, and whatever way, they choose. There are all sorts of things – musical instruments, lighting effects, and physical obstacles – for them to discover, navigate and explore independently or with the help of their adult. 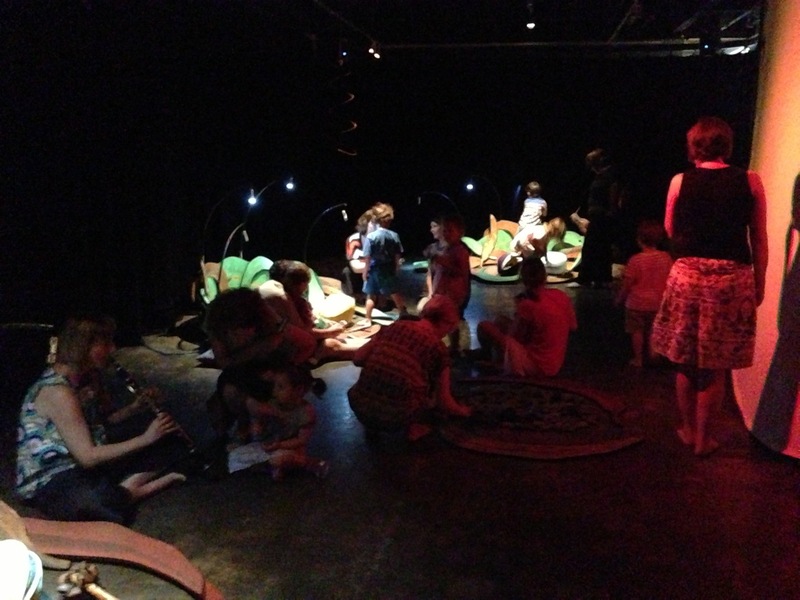 More than just exploration though, we’ve created the whole physical and aural environment in a way that (we hope) encourages the children to engage in musical interactions with each other, and with the musicians roaming the space. However, children aged 3-5 have an unerring and delightful tendency to not do what you are hoping they will do, and yesterday’s Nests visits were filled with examples of this! Children enter the space holding long, slender lanterns. These help illuminate their path as they enter the darkened space, but as the lighting lifts, there are places for them to leave these lanterns so that their hands are free to play the musical instruments (as you can see in the image above, where the lanterns are hovering over one of the nests). Well, some children simply loved their lanterns and wanted to hold onto them throughout. Even if they put them down momentarily when entering a nest, they made sure to pick them up again as they moved across to the next nest. The space was constantly awash with little children carrying their long, swaying lanterns. 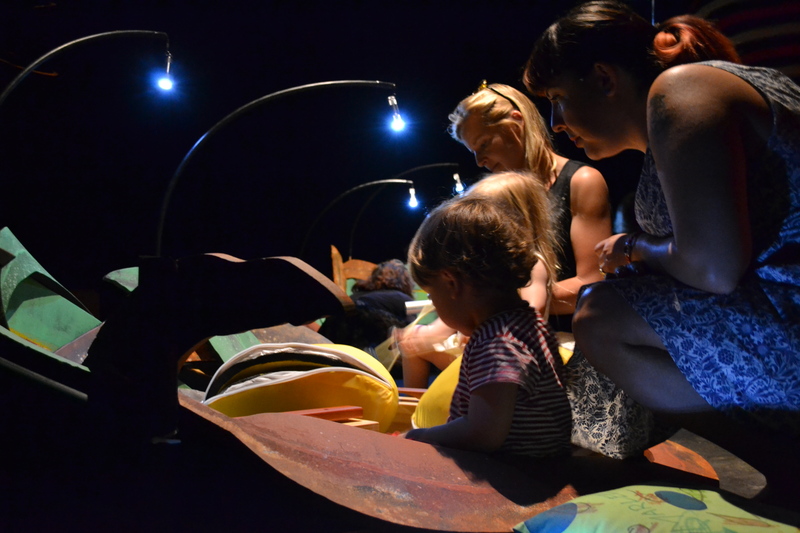 Other children were constantly drawn to the giant ‘sun/moon’ circular screen that acts as a backdrop to the space and is lit theatrically throughout to suggest different times of day. The lighting makes it possible to create dramatic shadow play with hands and bodies, and some children returned again and again to this screen with their parents, creating all sorts of images that clearly delighted them. These interactions have prompted us to think about how we might incorporate some shadow-play into the installation for stage 3. Observing children’s interactions with the instruments was also interesting. In one session, we seemed to have lots of children who took great pleasure in returning instruments to their eggs, and zipping the eggs up tight again, after they had had a play. It was very neat of them, but not something we’d seen in the first sessions of Nests back in February. It meant that the children got to ‘discover’ the instruments several times over, however, and perhaps this was part of the motivation. We had three adult musician-facilitators in the space, engaging and interacting musically with children – one person who was working with the instruments in the installation (a range of exotic percussion instruments from around the world and made from all sorts of beautiful materials), and two people playing wind instruments (me and one other). We imitated sounds that the children played, copying rhythms and pitches, and encouraged musical ‘conversations’. We also modeled interactions and imitation with each other. Children reacted to these interactions in different ways. I found that for some, it was too intrusive or perhaps made them feel self-conscious, and as soon as they noticed I was making a connection with their playing, they would stop. Sometimes, they would start again; other times, they would leave that nest and move to another part of the installation. For example, we have a very rhythmic section in the soundscape that encourages everyone in the room to groove along on a unison rhythm. One little girl was very responsive to this rhythm and began to do a little dance, stamping her feet in time with with the rhythm. I began to copy her, and her mother noticed and pointed it out to her daughter. But she wasn’t sure she wanted to share this idea with me. She watched me dance for a moment, then moved a bit further into the nest so that she was behind her mother, and continued her dance from there. Some children were intrigued by the idea of the musical conversations. There were some absolutely gorgeous moments where a child realised that the musician beside them was copying what they were playing! One little boy’s father was beside him, and described what was happening. “She’s copying you, isn’t she? Play it again and see what happens… play it faster! And faster again!” And so, that interaction was three-way, with the boy and his father playing a game with each other as well as with me. Tony, the other wind player, described a funny moment he had with one of the parents. He noticed a dad pick up one of the castanets and begin playing a rhythm. Tony picked up another of the castanets and began jamming with him. But then the man’s partner noticed what was going on and took the instrument from the man’s hands and put it back down on the ground! Perhaps she felt that such interactions were only supposed to involve the children, which was not one of our rules at all! In our discussions at the end of the day, Rebecca, Ken, Tony and I considered the role of the parents in the installation. A challenge with the ‘un-facilitated’ environment or lack of explicit instructions is that the adults might not be sure what is expected of them and their children. Nor do they know what is coming up next (all the cues throughout the installation are given in the recorded soundscape). In the third session of the day, Rebecca made a point of saying to the parents before entering the space that “everything here is fine for the children to explore and touch and interact with”. This statement helped the parents relax and allow the children to create their own experience. Another of our discussions has been about audience, and the importance of creating the work with both children and adults in mind. Early on in Nests, Rebecca approaches each of the adults one by one and gives them a wah-wah tube. “This is for you,” she tells them, and many parents seem delighted to be given their own instrument to play. We have also observed parents having their own moments of musical exploration, particularly with things like the little Meinl thumb piano, with its plaintive and nostalgic A-minor tuning. Many parents describe their Nests experience at the end as being “beautiful” and “peaceful”, and it seems to me that this is as much a description of their experience as that of their children. With some groups, the three of us found it challenging to make any connection with children at all, as they were so engaged with sharing the experience with their adults. I don’t think this is necessarily a problem – if Nests is a beautiful experience that parents and children can share together, then that is a wonderful outcome. Nests is developing further each time we present it; for this second stage, we had made some adjustments to the soundscape and the timings of the different ‘events’ or stimuli that take place within the installation experience for the children. We added a ‘good-bye’ song at the end, slowing down the energy as a way of containing and ‘holding’ the children in the experience and allowing them the space to process it. I also added a slow ‘bell toll’ in the middle of the soundscape designed for the parents to hear and join in with their wah-wah tubes. However, this didn’t really work – the parents didn’t notice it! I think I might take it out of the soundscape for stage 3. I also added a bass guitar line to the Jam & Groove section, which made it rock along a bit more, and invited a big whole-ensemble energy surge for children and adults to share at a key moment in the installation. These musical cues help guide the children’s attention towards different parts of the installation and give them different musical experiences beyond their own self-directed explorations. Stage 3 will be a weekend’s worth of Nests, on 11 and 12 May. Bookings open this coming Wednesday 20 March. In City Beats this week we created music about The Desert. Four groups from four schools came to ArtPlay over two days, and each group created four sections of music – a song, a melody, a soundscape and a rhythmic groove. At the end of the workshop we discussed how to structure and order the four sections of music, and finished with a recorded performance of the whole piece. This was our first City Beats project for the year, so we will see the children and their teachers 3 more times across 2013. I see the first workshop as a time for all of us to get to know each other, and for the children and teachers to get a sense of what they will be doing each time they come to ArtPlay for City Beats. We started the session with introductions, with the MSO musicians introducing ourselves and demonstrating our instruments. Then we did a quick rhythmic warm-up, including a name game in which everyone had to say their name in turn (thus demonstrating to the groups that their voices and contributions mattered), and a fast-clap-around-the-circle, which quickened the group’s responses and got them relaxed and laughing. 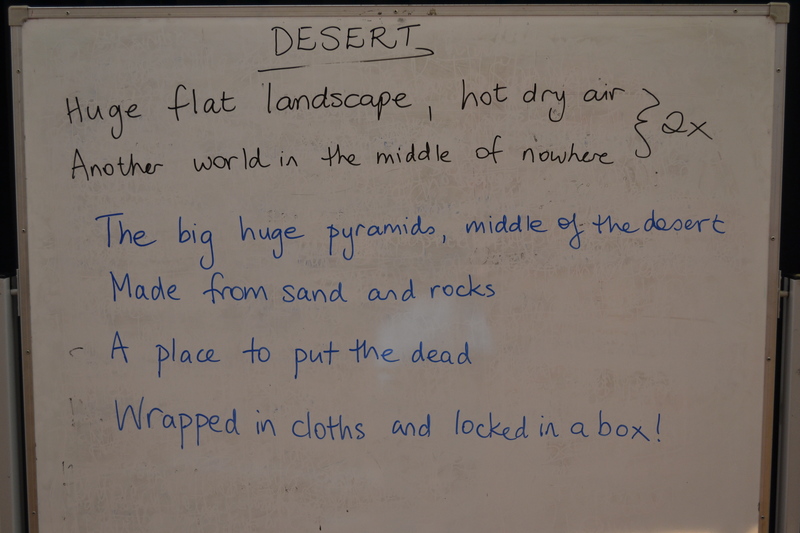 Then we brainstormed ideas about the desert (things you might see, hear or find there) and divided into smaller groups to start the composing process. I took charge on the songwriting groups. There were many memorable and special moments across the two days of workshops. I loved seeing the way the children I worked with took charge of things. In the first group, we made the mistake of setting the pitch of our song much too low for the children’s voices. I waited to see how they might solve the problem. One girl started to sing the song a fifth up – it sounded cool! – then said to me, “We need to change it because it doesn’t… feel -” she hesitated to find the words, so I said, “Because it’s too low? To make it higher?” “Yes,” she said emphatically. “It needs to be higher.” I got her to sing it on her own, matched her chosen pitches on the clarinet, and we found we had a much more effective melody than the one we’d started with. I asked a girl in one of my groups to hold my clarinet for me while I wrote lyrics on the whiteboard. “You just have to be careful of the very top of it,” I assured her. “That’s the only bit than can break easily.” She took it from me carefully. As I wrote I could hear the other children in the group whispering to her, “You’re so lucky you get to hold it!” “Can I have a turn?” I imagined them leaning toward the clarinet to have a closer look. I wondered if the little girl would be warning them off, or examining it for herself. I didn’t turn around to look. When I’d finished writing, I turned to her and she passed the clarinet back to me, holding it at exactly the angle it had been at when I’d passed it to her. I felt truly touched at the care she’d taken. “Thank you for looking after my instrument so carefully and so beautifully,” I told her. Swish, swish swish the wind blows the palm trees. One of the group said suddenly, “Can we cross out these words?”, pointing to “the palm trees”. “Sure,” I said, but then realised why – it was so that the line would end with “blows”, in order for it to rhyme with “goes” in the previous line. I hadn’t noticed that possibility. Once we had the shorter line, we realised it needed an extra word to make it scan properly. It was easy to add an adjective at that point. 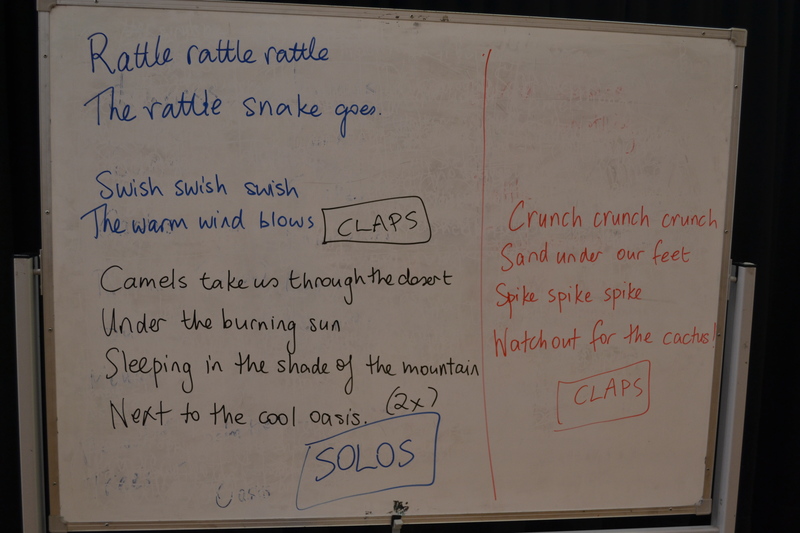 I love the set-up of the verses of the song above – I think the idea of having a ‘sound’ word repeated three times as a way of introducing a feature of the desert is a very 10-year-old approach – and therefore highly appropriate – to lyric-writing! They tried some others – “walk walk walk, the camel goes”, but they weren’t as convincing. If they’d said ‘spit’ or ‘bump’ I may have been persuaded :-). One of the groups came from an English Language School (an intensive English language-focused school for children who are newly-arrived in Australia; students can spend 6-12 months at language school before transitioning to mainstream school). 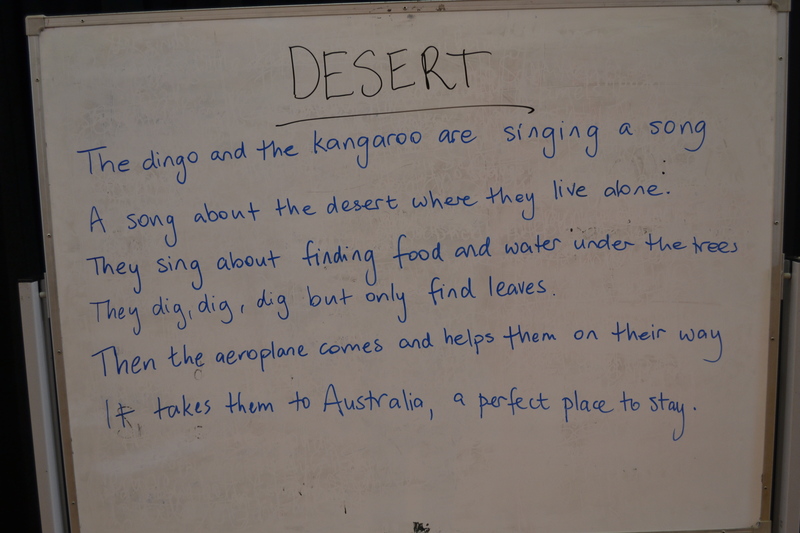 Their desert song was the only one that featured Australian desert animals like dingos and kangaroos. The City Beats ‘Desert’ workshop structure felt very effective and time-efficient – I think I may use it as a template for the remaining City Beats workshops. Dividing into 4 small groups gives us a range of musical responses that can be ordered and combined, and it means that over the course of the year, the children will gain skills and confidence in different group-composing approaches. 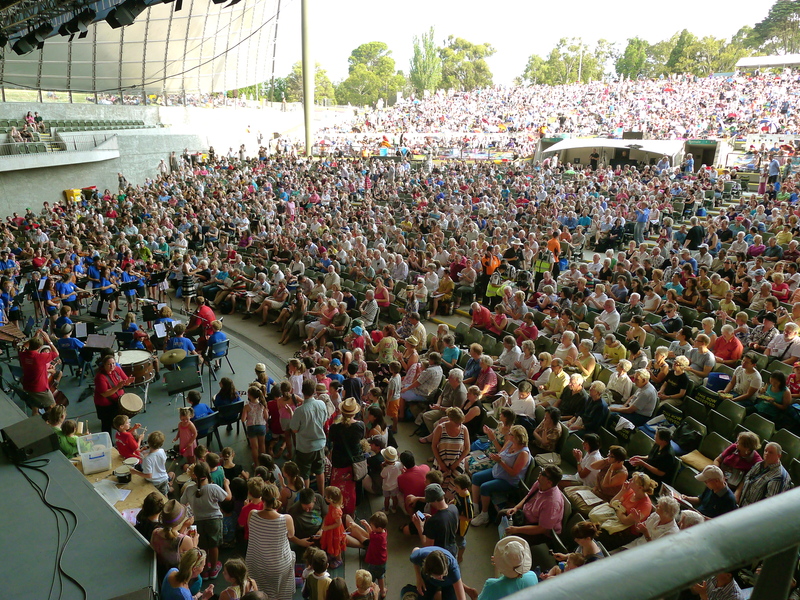 New video to share this week – here are some highlights from the Gypsy Jam I led for a crowd of thousands at an outdoor concert venue called the Myer Music Bowl a few weeks back. The footage gives a sense of the fun, fast-pace and heat of the evening! What’s coming up? I’m taking a bit of time away from my PhD reading this week; I’ve started the week by writing a couple of lectures (one on music, power, and social change, the other on informal learning and Musical Futures), which I need to present in a couple of weeks. Then, for the rest of this week I will be in at ArtPlay, one of my favourite places in Melbourne. 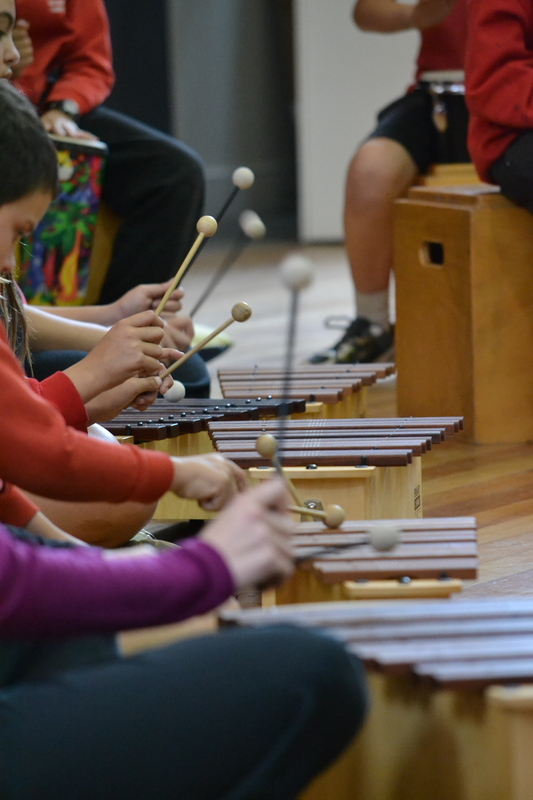 I have two days of City Beats workshops (City Beats is a longterm project that I direct for ArtPlay and the Melbourne Symphony Orchestra), and then the second series of Nests workshops. More about these projects when they are finished! There is a joyful immediacy and momentum in workshops that are fast-paced and focused on making and doing, and getting the creations out there. Real, tangible outcomes, ready for presentation or sharing, but not necessarily highly polished. 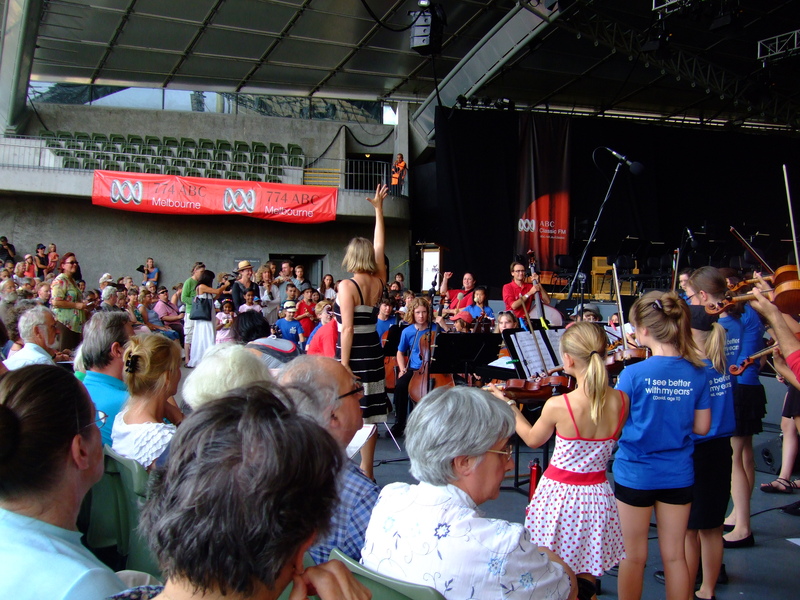 Two weeks ago I led the ‘Gypsy Jam’ (so-called because we were playing music inspired by Hungarian gypsy music) at the Myer Music Bowl for the Melbourne Symphony Orchestra. There were about 6000 people in the crowd when the jam took place, along with 50 young musicians providing the musical backbone, and around 100 young children and families who came down to the stage area to join in on percussion. It was definitely a jam for hundreds and thousands, as I predicted on this blog beforehand. The needs of the MSO, to be offering a fun and engaging participatory experience that wouldn’t prove too annoying for those in its audience that weren’t looking for participation and unorthodox pre-concert entertainment (remember, audiences for classical music are not always the most open-minded – they can be quite risk-averse and particular about what they want from the experience). All to be catered for in a jam lasting just 20 minutes! The Gypsy Jam wasn’t a particularly polished outcome – how could it be? We rehearsed the music with the young musicians for just 75 minutes beforehand. They also created some sections of music themselves, and spent some of their rehearsal getting used to the outdoor setting and doing soundchecks. There was a wide range of experiences and abilities in the group too – some were very strong players but others were still quite new to their instruments. Fast and messy workshops like these (‘messy’ is not be taken literally – I am using it in the sense of ‘not quite orderly, somewhat unpredictable’) make up for what they lack in finesse and refinement with an abundance of shared creative energy that is instinctive, responsive, ‘in-the-moment’, and, probably, risky. They are intensely focused and driven, but short in timeframe. (And a sidenote, the emphasis on quick responses and spontaneity does not equate with being unplanned. As a music leader, I find the planning for these kinds of events needs to be incredibly exacting, because it is crucial to make effective use of the limited time available). Fast, messy workshops can be exhilarating, because they have tremendous forward momentum. They can also be frustrating because there isn’t time to deliberate, reconsider, trial the options, dig into the detail, or even erase and start again. They push everyone in the group to trust their instincts, and trust in the process. It is not the most ‘composerly’ way, perhaps. But it is a good way nonetheless, with a powerful creative energy. It reminds me of poet Allan Ginsberg’s dictum of “first thought, best thought”, compelling his fellow writers to be fearless and spontaneous, to let go of the inner critic and express themselves with unfettered honesty and immediacy. Like Ginsberg’s spontaneous writing, the fast and messy music workshop also brings to the fore the amazing, strange, surprising, unexpected ideas that individuals may have floating around in their heads. Such ideas are not always easy to access if you are constantly conditioned to trust other people’s material more than your own. Processes that give you the opportunity to engage with your own ideas make you practised at accessing them in the future. I have spoken to a few past members of the 2006 Ensemble. They want to say thank you for giving them confidence in performing originals and using different ideas to turn it into one. There are a lot of us still playing our own music thanks to our experiences with you. I am sure that for this young player, her current compositions evolve through far more detailed and exacting processes than those we employed in the fast-paced, 2-day MSO ArtPlay Ensemble workshops. The important point is that through her fast and messy experiences, she had faced any fear, reluctance, or self-consciousness, and was practised at accessing her creative ideas. Even more importantly, she had confidence in them, so the ideas could flow. I was really satisfied with the outcome of our first Nests workshops. (Hmmm… Nests is a theatrical music installation with minimal facilitation or instruction. Are they workshops? Experiences? Sessions?) We offered 2 x 30 minute Nests experiences, both of which were booked out. Nine children per session attended with their parent (sometimes with a younger sibling in tow as well) and explored the space we had created for them. Some were shy, some were boisterous, but they all took their explorations quite seriously, grasping their long bendy-pole-torches in their hands, making patterns on the floor as they made their way into the darkened space, and choosing what to spend their time doing. Some children were content to sit with one instrument and play it for a long time, sharing the experience with their parent. Others were keen to try lots of different instruments. 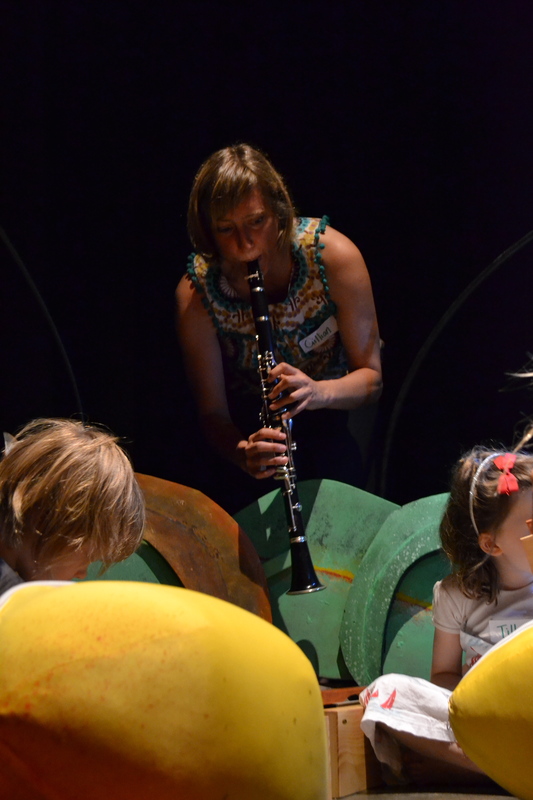 I moved through the space with my clarinet, squatting down to sit alongside children and imitate the sounds they were making, encouraging interactions, patterns and musical conversations. Some realised this was what I was doing and played along, offering up ‘tests’ to see what I would do (such as playing faster, or stopping suddenly). Rebecca was also moving through the space, handing out wah-wah tubes to each of the parents and showing them how to play them. Some parents later told how pleased they were to have their own instrument to play, especially one like this that was completely new to them! As the children and the parents explored, Rebecca and I responded to their playing with our own musical sounds. Nests has a musical aim of encouraging children towards interactive play with their instruments (rather than only independent play, more typical of children of this age group in an installation environment), where they would be listening and responding to other people’s sounds, as well as initiating their own, and the musical responses offered by Rebecca and I modeled how this could work to the children. Gradually the birds and crickets of the forest soundscape that had greeted the children when they entered the installation changed into more dramatic sounds of nature. A huge storm began to build on the recorded soundscape, inciting more vigorous and frenzied playing from the children. 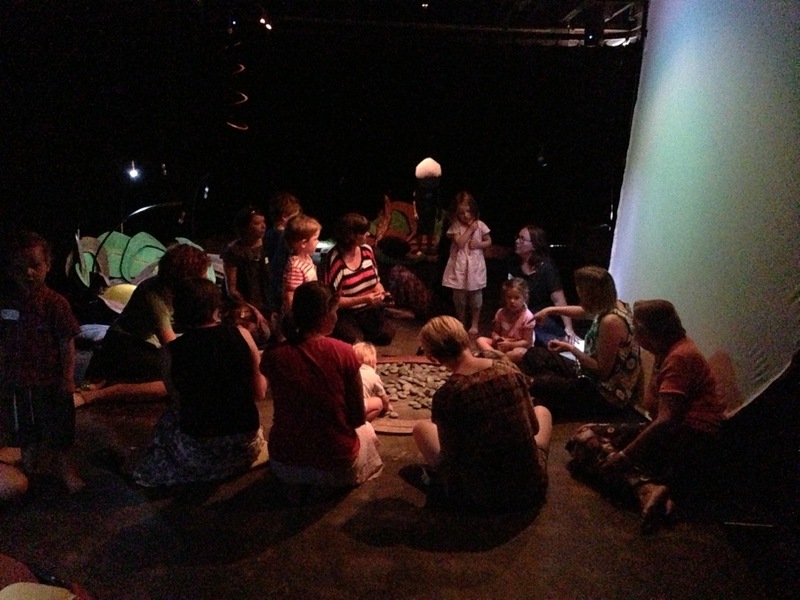 And emerging out of the intensity of the storm, some rhythmic unisons on the recorded soundscape encouraged all the children and their parents to play together and enjoy the experience of a shared groove. Can you see him? Look at the slightly eery glowing light in the background of this image. 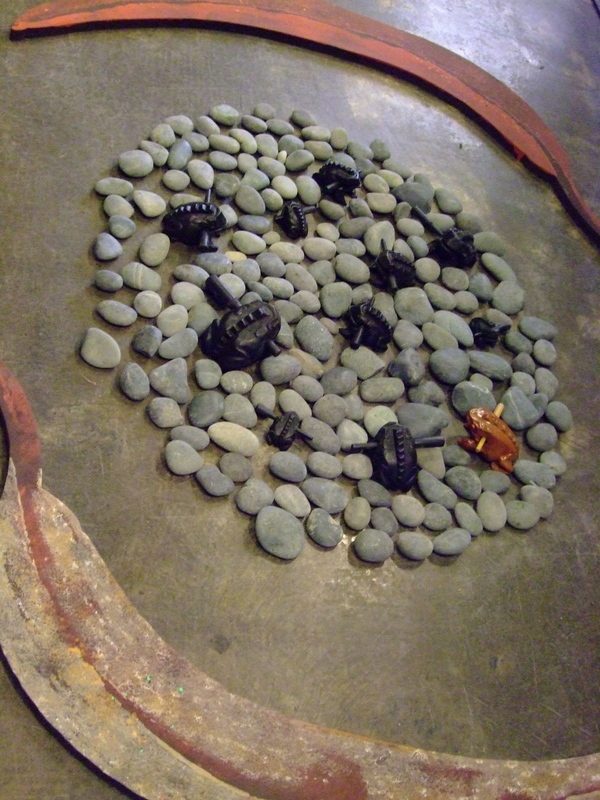 Most of us are sitting around the frog bog, playing the frog-guiros. But the strange glowing light is a little boy with an egg on his head, enjoying his own private exploration of the space. 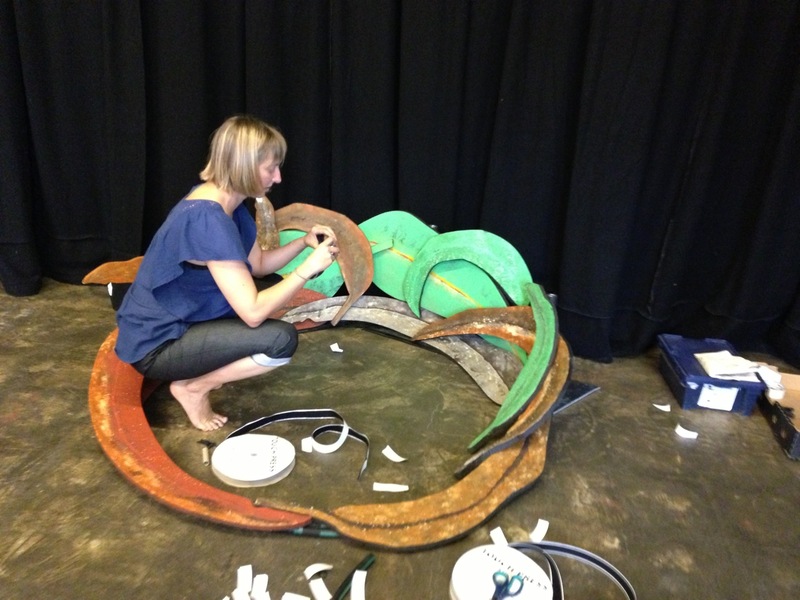 Nests has been funded by ArtPlay and the City of Melbourne, through ArtPlay’s New Ideas Lab process. The New Ideas Lab invites artists to pitch a concept or a vision for a children’s arts experience, and supports a selected number of these to be developed and realised at ArtPlay the following year. The second stage of Nests is on March 16th and is already booked out, but the third stage will be held on Saturday 11 May and is not yet on sale. 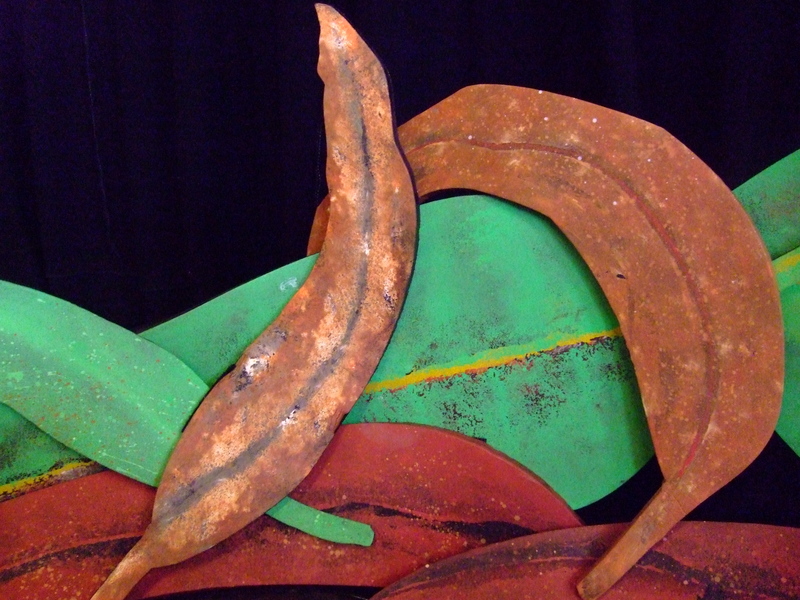 If you are in Melbourne and would like to bring your 3-5 year old along, be sure to to ‘like’ ArtPlay on Facebook and to sign up for their mailing list so that you will receive updates about when the next workshop season goes on sale. With Nests, my collaborators Ken and Rebecca and I have been given the creative space (and funding) to develop the work in three stages. We knew that there were some aspects to the concept that needed trialling, in order to fine-tune the details of the installation experience. The three stages allow us to try our ideas and observe the children responding to the space and the instruments, enabling us to create by the third stage the richest possible experience of exploration and interaction for our chosen age group (3-5 year olds). Stage 1 of Nests took place at the start of February, with two sessions open to the public. We spent a day bumping in the show the day before, constructing the three Nests under Ken’s instructions, setting the lights and placing the instruments in the respective eggs and nests. Each nest is made of individual leaves (crafted from the light-weight foam that is used for camping mats and yoga mats), water-cut to their specific shapes by a specialised cutter, and hand-painted by Ken. The detail is beautiful. I’d organised the instruments into groups, matched according to pitch and tone-colour so that each of the three nests would have its own particular musical ‘flavour’. 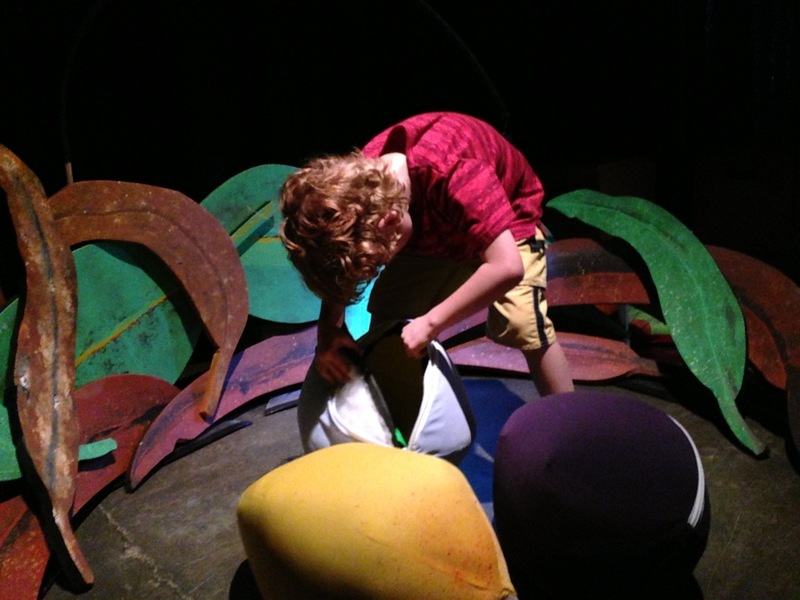 Each instrument had a large-scale egg to live in; the eggs had big zippers in them, so that the children’s first task in the installation would be to open an egg and find the instrument inside. I’d chosen instruments for their physical beauty and exotic qualities as well as for their sound. We had things like bass tone bars (a rich, deep, caramel sound), an extremely resonant, energy chime, a 2-row thumb piano, juju shakers, some strange sprung clackers that I bought when I was travelling in Vietnam a few years ago, a log drum from Africa, hewn from a length of tree trunk, and some small castanets. We also had 2 sets of wah-wah tubes. An ongoing area of discussion in Nests (and probably in most installations) has been about how the young audience will enter the space, and the pathways they will choose as they move about the installation. We wanted it to be a magical ‘other world’ would encourage the children to explore with care and attention, so we were a little thrown when we trialled the instruments at the Creswick Playscape in December and the children began running around, boisterously bouncing from place to place, nothing really holding their attention (apart from the sand in the sandpit). Of course, the environment you create determines many things about how people will interact with the space and each other, and an outdoor space, familiar to the children as a place for energetic play, was quite different to the theatrical installation we were imagining. Nonetheless, Rebecca, a visual theatre and reverse pedagogy specialist, gave a lot of thought to the question of how the children would enter the space, and her genius solution came about through watching her son at play. At some stage, while walking in the bush near their home, her 4-year-old picked up a bendy stick and began to carry it with him. Rebecca noticed how carrying the stick changed the way he moved about. His feet moved more slowly, and he carried his little body differently, with a kind of alertness. Building on this observation, and her boy’s obvious delight in the bendy stick, Rebecca and Ken devised light-poles for each of the children to carry when they entered the installation. The light-poles were made of thin, flexible dowel and had a small LED torch [flashlight] fixed to the end. The children could carry these in front of them or behind. Later, he told Rebecca and Ken, “I really like what you guys have done with this space!” Here he is, unzipping his first egg.